Honey bee colonies in the United States have been dying at high rates for over a decade, and agricultural pesticides—including fungicides, herbicides and insecticides—are often implicated as major culprits. Until now, most scientific studies have looked at pesticides one at a time, rather than investigating the effects of multiple real-world pesticide exposures within a colony. A new study is the first to systematically assess multiple pesticides that accumulate within bee colonies. The researchers found that the number of different pesticides within a colony—regardless of dose—closely correlates with colony death. The results also suggest that some fungicides, often regarded as safe for bees, correlate with high rates of colony deaths. The study appeared online September 15, 2016, in the journal Nature Scientific Reports. The researchers followed 91 honey bee colonies, owned by three different migratory commercial beekeepers, for an entire agricultural season. The colonies began their journey in Florida and moved up the East Coast, providing pollination services for different crops along the way. They also spent time in locations meant for honey production, as well as “holding areas” where beekeepers prepare large numbers of colonies for upcoming pollination contracts. A total of 93 different pesticide compounds found their way into the colonies over the course of the season, accumulating in the wax, in processed pollen known as bee bread and in the bodies of nurse bees. At every stop along the beekeepers’ itinerary, the researchers assessed three different parameters within each colony: the total number of pesticides; the total number of “relevant” pesticides (defined as those above a minimum threshold of toxicity); and each colony’s “hazard quotient,” a measure devised by other researchers to integrate the total hazard posed to each colony by the cumulative toxicity of all pesticides present. All three measures correlated with a higher probability of colony death or queen failure. In addition, the researchers found between five and 20 different pesticide residues in every sample of bee bread that exceeded a hazard quotient’s safety threshold. The highest number of pesticides accumulated in the colonies early on, shortly after beekeepers placed colonies into early season flowering crops like apples and blueberries. Honey production stopovers and holding areas offered the bees some respite from further contamination. The study results also suggest that some fungicides, which have led to the mortality of honey bee larvae in lab studies, could have toxic effects on colony survival in the field. In the current study, pesticides with a particular mode of action also corresponded to higher colony mortality. For example, the fungicides most closely linked to queen deaths and colony mortality disrupted sterols—compounds that are essential for fungal development and survival. The current study borrows a concept from human cancer research: the “exposome,” or the sum total of chemicals an organism is exposed to over its lifetime. But instead of looking at individual bees, the researchers assessed each colony as a single “superorganism” that functions as a single, cohesive unit. Within this framework, the researchers tracked the death of queen bees, which is a life-threatening event for the colony as a whole. In some cases, a colony is able to create a new queen, but if those efforts fail the entire colony will die. 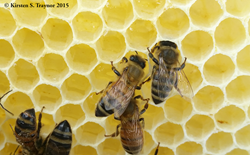 In the current study, colonies with very low pesticide contamination in the wax experienced no queen events, while all colonies with high pesticide contamination in the wax lost a queen during the beekeeping season. The research team did not find a significant contribution from neonicotinoid pesticides. These compounds, derived from nicotine, are currently some of the most common pesticides in use globally. Because of their ubiquitous use, neonicotinoids have received significant media attention for their potential role in honey bee declines. Because industrial practices have changed since the researchers collected the data for this study, Traynor and vanEngelsdorp acknowledge that further research could reveal new patterns in the relationship between pesticides and honey bee health. But the current study nonetheless offers some important insights for beekeepers and farmers alike. In addition to Traynor and vanEngelsdorp, study co-authors include Jeffery Pettis (U.S. Department of Agriculture), David Tarpy (North Carolina State University), and Christopher Mullin, James Frazier and Maryann Frazier (Pennsylvania State University). The research paper, “In-hive Pesticide Exposome: Assessing risks to migratory honey bees from in-hive pesticide contamination in the Eastern United States,” Kirsten Traynor, Jeffery Pettis, David Tarpy, Christopher Mullin, James Frazier, Maryann Frazier and Dennis vanEngelsdorp, was published in the online journal Nature Scientific Reports on September 15, 2016. This work was supported by the National Honey Board. The content of this article does not necessarily reflect the views of this organization.